Indiana Works — Aspire Indiana, Inc.
(Vocational Services or Career Connections) please click here. Referral Form for Northern and Central Indiana Works. What is Work Incentives Planning and Assistance? Work Incentives Planning and Assistance (WIPA) services are commonly known as "benefits counseling" for individuals who are receiving Social Security Disability Insurance (SSDI) and Supplement Security Income (SSI) who are currently employed, re-entering the work force or are interested in work. 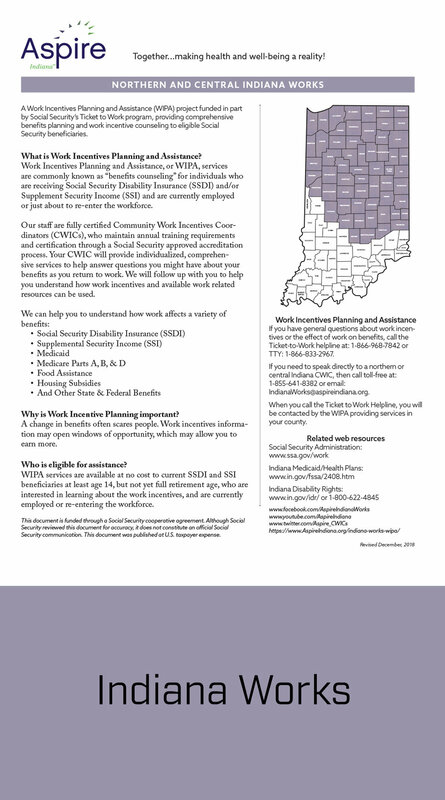 The Indiana Works staff, consisting of Community Work Incentives Coordinators (CWIC), have been trained to assist persons with disabilities who receive Social Security benefits, to determine the effect that employment earnings will have on their benefits and identifying possible resources in their pursuit of employment goals. This document is funded through a Social Security cooperative agreement. Although Social Security reviewed this document for accuracy, it does not constitute an official Social Security communication. This document was published at U.S. taxpayer expense.